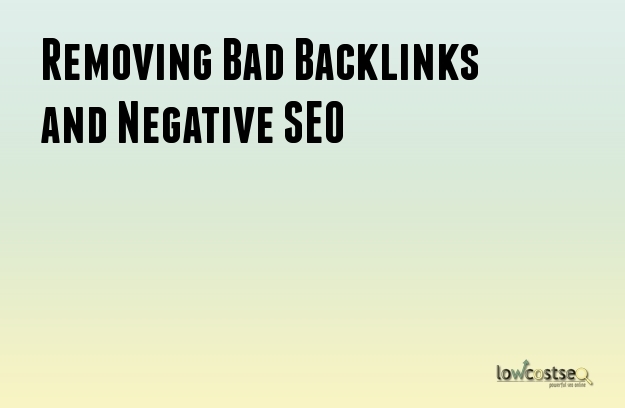 Today we will discuss removing harmful backlinks that can lead to negative SEO. We have seen a growing number of clients talk to us about how to recover from penalties that were imposed on their sites after the Panda and Penguin updates. It is not easy in doing so. We always tell our clients that the reason they got hit was because they failed as business owners or webmasters in selecting the appropriate SEO companies for their business. If you see automated link building sites or bolster your site to the top in 10 days ads etc., these should act as warning signs to you to keep away. In SEO, always follow the rule of the thumb, if it’s too good to be true then it sure is. Will removing Bad Backlinks recover the search rankings? In some cases yes and some no. We have seen some reversal of results when the bad links were removed from some of our client’s sites however on some sites no positive impact whatsoever was noticed. There has been a growing negative trend of businesses purposely building bad backlinks so that they can get business from webmasters as they use these dirty tactics to financially exploit the website owners. So how do we go about removing bad backlinks? First we must identify the source where they are coming from. We must try to locate and remove any malicious software that has been installed on the client’s FTP or admin to create automated links. We will then consult those website owners to remove the links and if they refuse to do so then we get the links removed via the disavow method through Google webmaster tools. All in all, it is important that a website links are cleaned or removed or else it will be added to Google’s database of sites that have had their links disavowed. We believe there is no difference when it comes to no-follow and do-follow backlinks in relation to negative SEO. Google can easily detect if you are creating a spammy link building campaign and will penalise you for doing so. If you are serious about SEO, avoid building links from un-trustable sources and play it safe when it comes to SEO. One misconception that we want to clear is that when you add a domain to the disavow file on Google webmaster tools, it does not get penalized, instead just becomes a no-follow link. There is no way that someone else’s website can get penalised just because it gets added on the disavow file because if that was the case many corrupt webmasters would build hundreds of spammy links and get their competitors site’s penalised as a result. All in all, the Disavow tool is meant to be a way in which spammy links can be removed from your link profile. We are currently working on many clients that have been hit by penalties and the best way forward is to first find the root of the problem rather then start building links again the correct way. We advise to clean your link profile then re-start the SEO campaign. Many people give up on their websites as there is no set time lag of when the rankings would return back or not. It’s a matter of patience and persistence in getting all the bad links removed from the site. If you want help in the removal of your backlinks then contact us at Lowcostseo and we will surely help you in doing so.